The perfect dinner party appetizer! Sweet, savory, tart, creamy, crispy, chewy...DELICIOUS! Try this recipe for your next Fall gathering- this also raves for Christmas gatherings! 2Lay out baguette slices evenly on a sheet pan. Drizzle w/ extra virgin olive oil and lightly sprinkle with sea salt. 3Toast in oven for 5-10 minutes or until 'just' browned, set aside to cool. 4In a pot on med/high heat, add all Cherry Compote ingredients stirring well until compote begins to boil. 5Remove from heat and set aside allowing compote to cool and thicken. 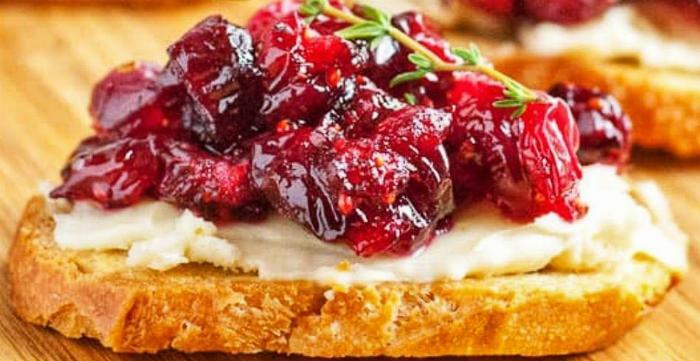 6Combine all ingredients well for the Goat Cheese Spread, set aside. 8Apply crostini (toasted baguette) with a layer of your Goat Cheese Spread. 9Add a dollop of compote atop. 10Add a small sprig of thyme. This is an awesome appetizer to serve all year round! Feel free to substitute any of your other favorite dried fruit in this compote recipe!